We stopped by the Vatican to have a chat with Pope Francis this past July, but sadly, he wasn't in. However, our disappointment soon dissipated into sheer wonder at the masterful architecture and beauty of St. Peter's Basilica! 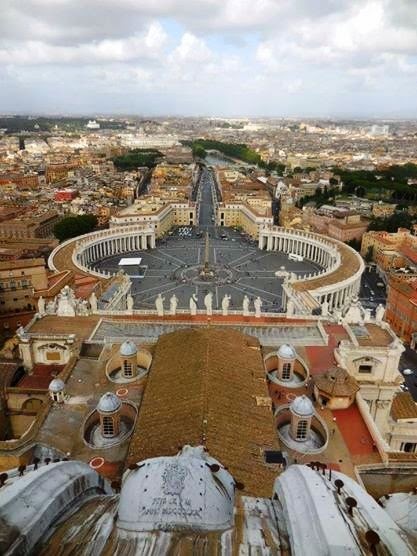 Although there has been a church on Vatican hill since the fourth century, the current St. Peter's Basilica dates only to 1626, when its 120 years of construction were completed. 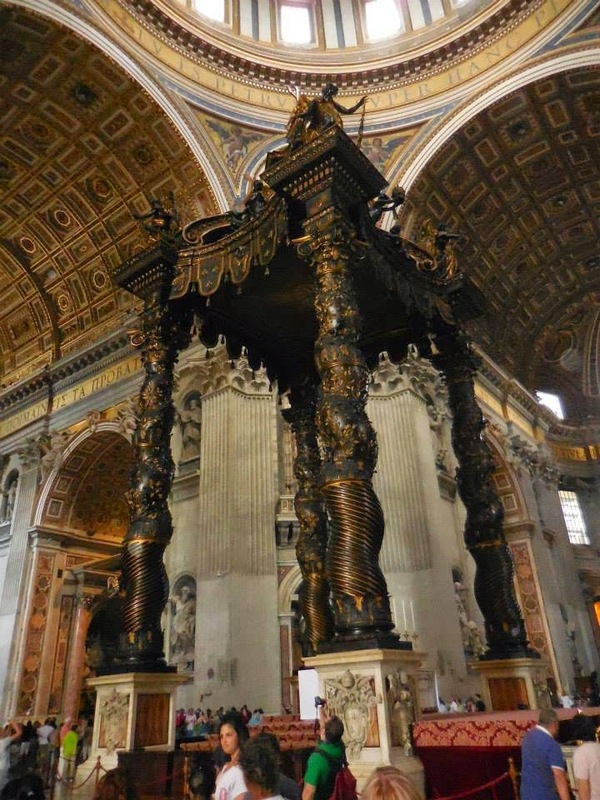 Considering artists such as Michelangelo and Bernini were involved with the planning and building, it's no wonder that St Peter's has become known as the "greatest church in all of Christendom." We knew St. Peter's would be impressive, but nothing can really prepare you for it. It's huge. Down the center nave, a line marks where other churches and cathedrals would end if they were placed inside the Basilica. Having visited St. Vitus in Prague, St Paul's in London, the National Cathedral in Washington, D.C., etc, in the past, it was amazing to see where the length of those cathedrals compare to the massive size of St. Peter's. You're almost tempted to disbelieve it, though, since the Basilica was designed and constructed in a way that makes it seem smaller than it truly is. This optical illusion was intended to make the church, and God, seem more approachable to the worshipper. 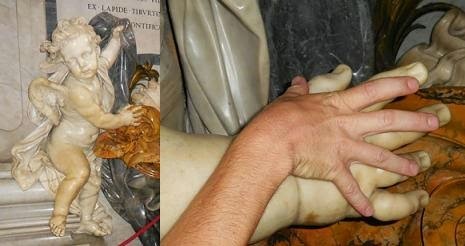 The statues in the Basilica are also fashioned to appear smaller. See the cherub up there? Doesn't he look like you could just scoop him up and pinch his cheeks? (Ok, so maybe that's a slight exaggeration...) But as you can see from the picture on the right, its hand dwarfs that of my husband. And my husband has some big hands! As you continue down the nave, alternating your gaze from left to right at various side altars and statues, you finally reach Bernini's High Altar, situated directly beneath one of Michelangelo's greatest masterpieces: the Dome. Be prepared for some serious neck-craning action. 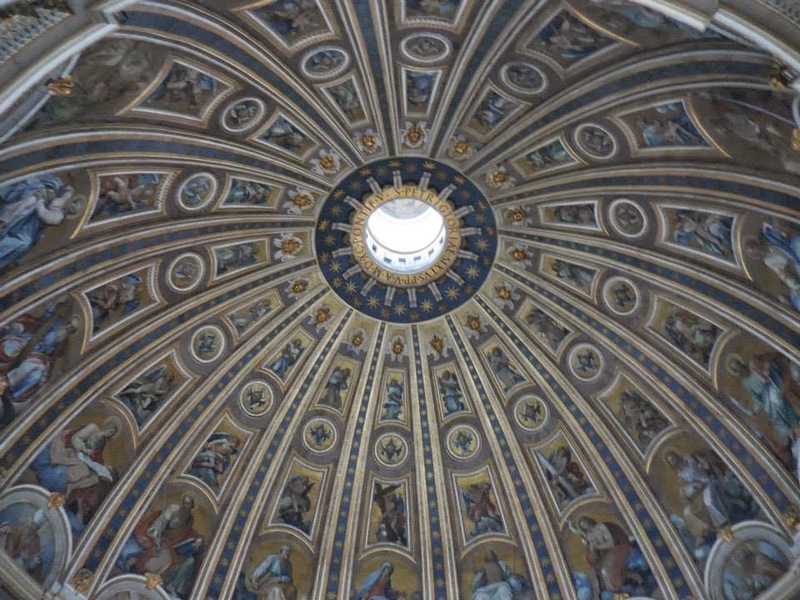 The Dome draws your eyes upward, intent on bringing your attention to God and reminding us of our own small stature in comparison to His greatness. The brilliant colors and masterful artistry proved too much for my small camera, and my pictures cannot do the Dome's beauty any justice. The juxtaposition of the blue "ribs" running up the Dome with the gold stars and gold lettering at the very top were absolutely stunning. The saints, apostles, popes, and artists featured in the Dome's fresco seemingly dance above and around the high altar below them and encourage the viewer to join them. Beneath the Dome and beneath the High Altar purportedly lies the grave of St Peter himself. Sadly, there's no way to get a good look at the tomb. If you stand on your tip-toes and crane your neck, you can get a limited view. But there are no markers or indication as to what's hidden beneath the altar, so an uneducated visitor would remain clueless. You can descend into a small portion of the crypt below the basilica floor (many popes are buried there), but again your views of the tomb are extremely limited. 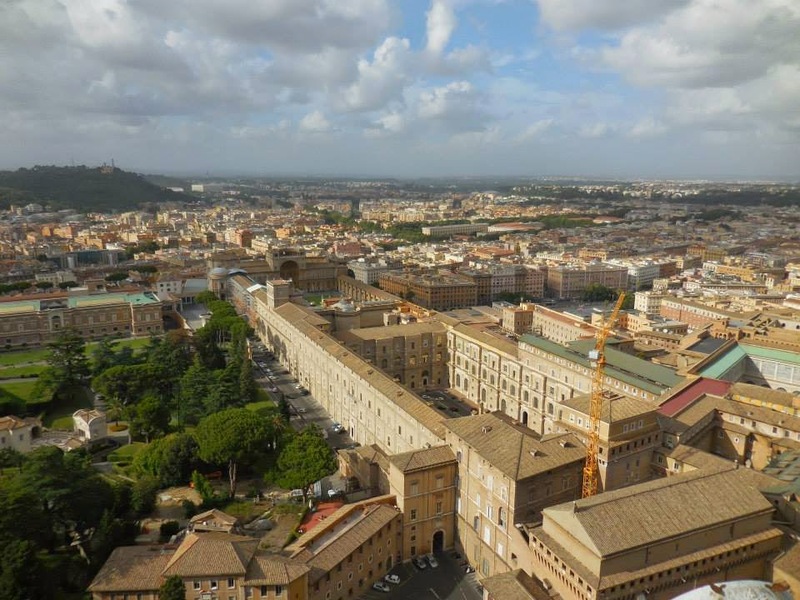 For better views, however, it is well worth springing the 5 euros to climb to the top of St Peter's to see Rome laid out before you! For an additional 2 euros, you can skip the first 320 steps by taking the elevator; honestly, the first 320 steps are not that difficult, and we made it up before the folks behind us in line got through the line at the lift. Your first "resting stop" is inside the dome, looking down to the nave's floor. For acrophobics like myself, this can be rather daunting. I think I spent the entire time pressed against the walls! But nothing could replace the experience of touching the mosaic pieces with my own hands or catching the tail-end of a mass from the dizzying but spectacular vantage point of the dome! 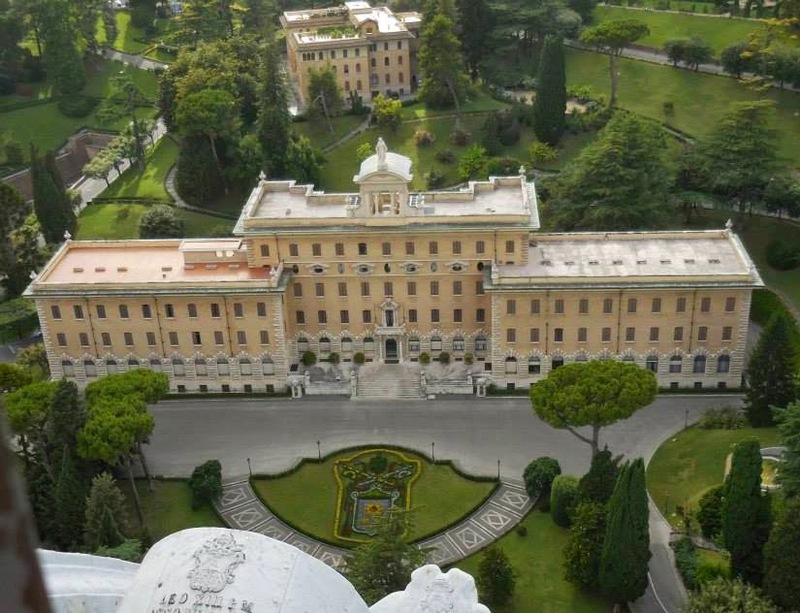 The long building with courtyards is the Vatican Museum. Saving the Dome climb for the end of our visit to the Vatican capped our day perfectly. When you've relished vistas as beautiful as this, how can you possibly top it? Reluctantly, we made our way down to terra firma and back out into Rome. Our day at the Vatican ended up being the highlight of our Roman experience, for both spiritual and aesthetic reasons. I respect and admire Michelangelo, Bernini, and the other artists who endeavored to honor the power of God and attempt to bring the viewer closer to Him through their masterful designs and art in the Basilica. While the hordes of tourists did not lend a particularly quiet atmosphere to St. Peter's, the architecture and design made me feel so small and yet embraced by both the hugeness of the Basilica and the greatness of God. 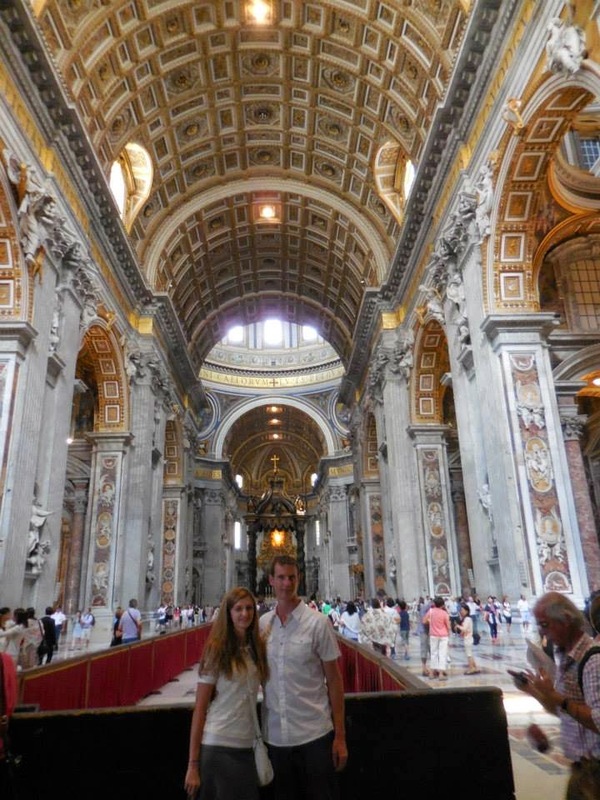 Have you visited St. Peter's Basilica in the Vatican? 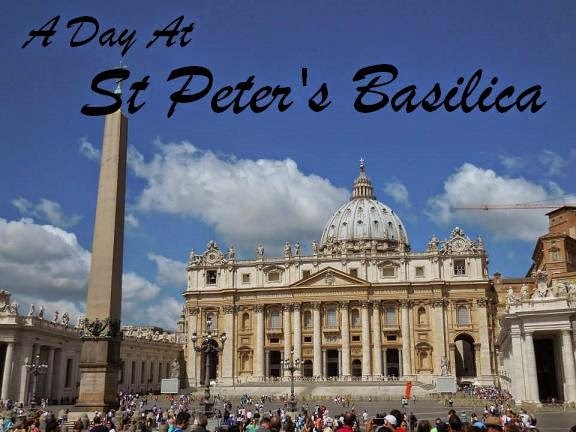 Cost: FREE entry to the Basilica! 5-7 euros to ascend the Dome. Time Needed: You could breeze through in 30 minutes if you really have no interest in churches, history, or artwork. However, I'd recommend 2-3 hours, particularly if you want to climb the Dome (so worth it). Accessibility: Currently, the Basilica is not immediately near a Metro line. 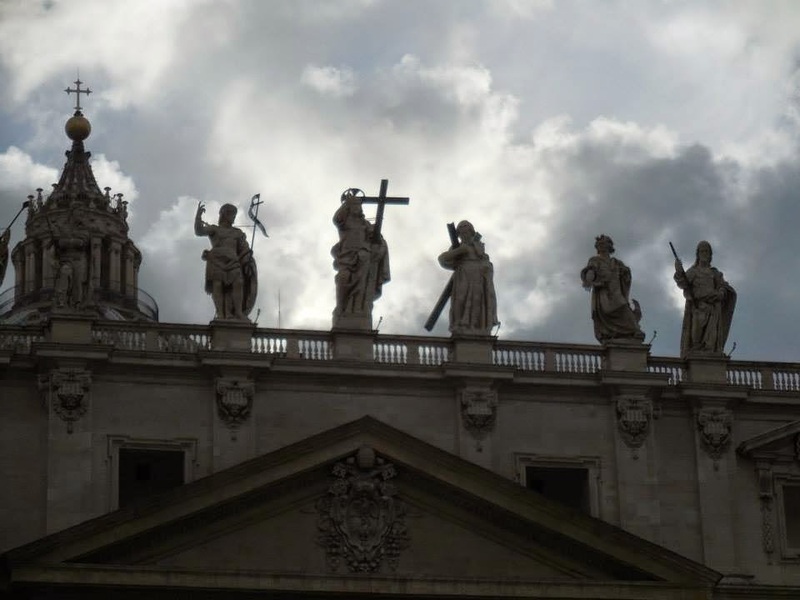 We took Line A to the Ottaviano - "San Pietro" station and walked south on Via Ottaviano. It was about a 10-15 minute walk. Tips: Download Rick Steves' free podcasts on your smartphone! He provides excellent explanations of various parts of the Basilica, and you'll feel much more knowledgeable after listening. Linking up with other travel bloggers for the #WeekendWanderlust! I will be going next year on our Italy trip! I really want to climb to the top. Justin and I both have a slight fear of heights (okay, maybe him more than me!) but we'll do it anyway. Well worth it for that view! Oh man, I definitely had a few moments that made me nauseous up there! I actually thought climbing St Paul's was worse, though, because the last section of St Paul's has metal stairs that are not opaque. Looking down almost gave me a panic attack! Wow, I saw pictures from then and it looked packed!!! After reading your tips, I've just realized that I think my hubby was listening to the Rick Steves podcast on his phone when we were there in June and didn't bother sharing it with me. I just basically looked around but didn't know what I was looking at. He for some reason was on his phone and seemed to know a lot. Hmmmm.... Anyways, I had no idea about all the optical illusions to make the place seem smaller. That comparison picture with the hand really demonstrates that. I just love Rick Steves' podcasts; I feel like I learn so much more than by just wandering around. this is at the top of my to visit list in Rome. If I ever get there. Italy and I just seem to fail at every turn! Sounds like me and the greater part of the UK! "Our State Fair is the Best State Fair!"